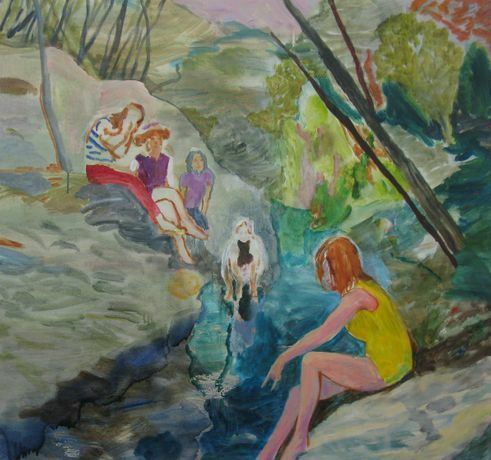 Exeter Phoenix is pleased to present this solo show of recent paintings by Eleanor Moreton. At first glance, Moreton’s paintings may appear to share a shimmering, arcadian or idylic quality that often, on closer inspection, belies a darker, more troubling subtext. Her practice is underpinned by an interest in psychoanalysis and her work explores ideas of repression and revolution, weaving together the historical and cultural and the more intimate and domestic. In this exhibition, her works work touch on reference points that range from colonial-era Africa to 1960’s west-coast American counter-culture; from German symbolist painting to imagery of the ‘floating world’ of Edo period Japan and formal Persian gardens. Paintings such as The Murderers (pictured above) are based on images of Charles Manson’s Family at play. Moreton employs a fluidity of space in her painting, whereby elements of scale, location, colour and perspective are gently disjointed or displaced within the picture plane – an exploration of painting itself as a way of making meaning, understanding her own past to help her negotiate the present.